After being substantially rained on earlier in the day I turned up at the Wales Millennium Centre wearing three different people’s clothes, including a too-small purple hoodie under an Iranian wool cardigan—by chance the perfect ensemble for Wardrobe Diaries, a devised circus piece that uses six Chinese Poles fixed to a large truss structure, but takes its inspiration and content from a charity shop’s worth of secondhand clothes, on display rails and heaped in piles on the floor. Directed by James Roberts, formerly a performer in NoFit State’s Immortal, and Bridie Doyle, who also teaches with NoFit, Wardrobe Diaries pulls together a set of discrete scenes and ideas, soundtracking them heavily with the warm, domestic music of Ted Barnes. Near the start two of the cast pull over rails of clothes and pick out garments for each other; seeming at first to be the comic spectacle of two people selecting just the most awful or inappropriate or smallest items, the sequence gradually clarifies into a kind of time-lapse of age as the clothes track generational habits—with the performers sort of pushed down and isolated by the character of the layered clothes. It’s a fertile idea, that the information of lives is compressed and stored in everyday objects, and one that might have been illuminated and complicated by the status of the performers as blank canvases (their default costumes are simple white)—but it appears only once, and what starts to supersede it is the slightly generic flirtatious playfulness of devised theatre characterisation, and the onstage wardrobe shifts from being a store of residual identities to being a prop resource for object manipulation. Still, this later-stage material gives us two funny pieces of puppetry: Paolo Locci’s irate Italian child, about two foot tall, bobbing hyperactively as he alternates between threatening the audience and hankering after a delicious banana; and a handbalancing act where Craig Turner wears shoes on his hands, trousers on his arms, and a large hoodie over his legs (the hood rounded out by a football) and toughs it out through an extended sequence of advanced one-arm handstands, his trainer yelling at him all the while. 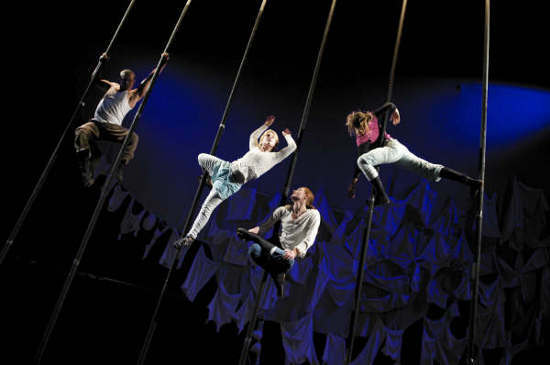 The Chinese Pole work in the piece makes great use of the expanded possibilities of the multiple poles, which are close enough together that a performer can traverse one side of the rig to the other, but it’s difficult to say exactly where the circus skills sit in relation to the piece. It’s not about what they mean; just about what sort of tensions they build or release, and what role they play in managing the various threads of the production—and for Wardrobe Diaries the circus is principally a mode of lyrical image-making. It’s exceptionally beautiful to watch the cast walking in sequence across the line of poles, diagonally and up, in each others footsteps rather like a party of mountain climbers, or to see one performer hoisted on a strop, swinging the breadth of the stage as a storm of paper shreds is shaken from her dress. When the same eye that can create these sorts of stage pictures focuses closer on the minute workings of the piece, Wardrobe Diaries—or whatever work follows it—will really come alive, and be something more than a collection of enjoyable and affectionate vignettes.